G.C.S. is short for Great Comfort Service - representing the unique experience we strive to offer our customers - in terms of quality, safety, efficiency, swiftness and overall service. We are located in Voorhout and operate in a broad region around Leiden and Teylingen. In addition, we are available 24 hours a day, 7 days a week. Your safety and delivering excellent service are the focus of our certified, English-speaking drivers. All of our taxis are smoke-free, and have A/C (air conditioning). All our drivers are in possession of the required diplomas and the so-called 'chauffeurs pass'. The latter is a Dutch certification, which represents reliability, GCS being in compliance with the local regulations, and having sufficient street knowledge. The chauffeurs pass is an official document which is issued by the Dutch Ministry of Transport & Water Management. Estate: G.C.S. 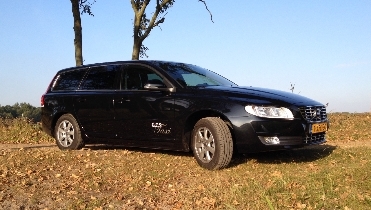 Taxi has a luxurious Volvo V70 at its disposal with room for four passengers and their luggage. 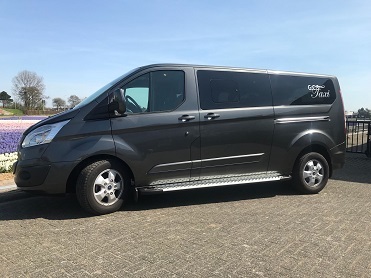 8 Seater Minibus: G.C.S Taxi has a very spacious and luxirious MPV taxi - Ford Tourneo - which holds a maximum of eight passengers. In addition this MPV can hold up to ten suitcases of standard measurements. Both cars are ideal for taxi rides between our home and Amsterdam Schiphol Airport (or another airport). G.C.S. Taxi is also well-equipped for children: to safeguard a child's safety we have certified children's seats (both baby and toddler). For the larger toddlers we have cushion enhancements.